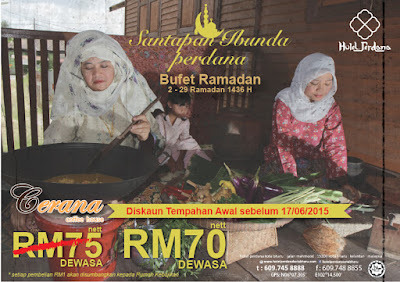 As Ramadhan is fast approaching, Hotel Perdana Kota Bharu is set to cook off and bring back delicious kampong flavors this coming Ramadan with ‘Santapan Ibunda Perdana’ at Cerana Coffee House. In showcasing local dishes, the team of chefs headed by Executive Sous Chef Ibrahim Abu Lasi will showcase over 168 tempting buffet spreads highlighting a mixture of local dishes from all overMalaysia. 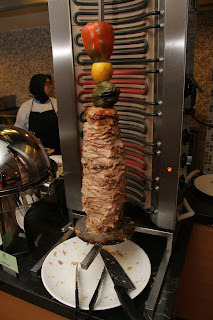 The menu will be rotated daily to satisfy your palate, from 2nd day of Ramadan till end of Ramadan. A ‘Pasar Malam’ in a Hotel concept will be the highlight featuring spreads of starters which includes selections of Kerabu such as Kerabu Daging, Kerabu Telur, Kerabu Sausage, Karabu Taugeh and Kerabu Jantung Pisang. An array of soup to choose from such as Sup Tulang Rawan, Sup Perut, Sup Kambing or Sup Puyuh is worth a try. For a more real life kampong ambience, 5 ‘Kawah’ is set by the pool for daily Gulai Kawah Specials which includes Gulai Kerutuk Che Banding, Kari Kepala Ikan, Gulai Kawah Ayam Kampung Sumatera & Kari Kambing Gearbox. The ever popular daily action station stalls offering different live cooking such as Whole Roasted Lamb, spice & roast, Ikan Bakar stalls, local favorites such as Kway Teow Kerang, Chicken Kebab, Apam Balik Pisang and many more. Be spoiled with delightful desserts such as Chocolate fountain, Apple Crumble, Tiramisu Cake in glass and local kuih such as selections of Pengat Pisang, Tapai Ubi, Cendol Pudding in glass and the Ice Cream & condiments station. 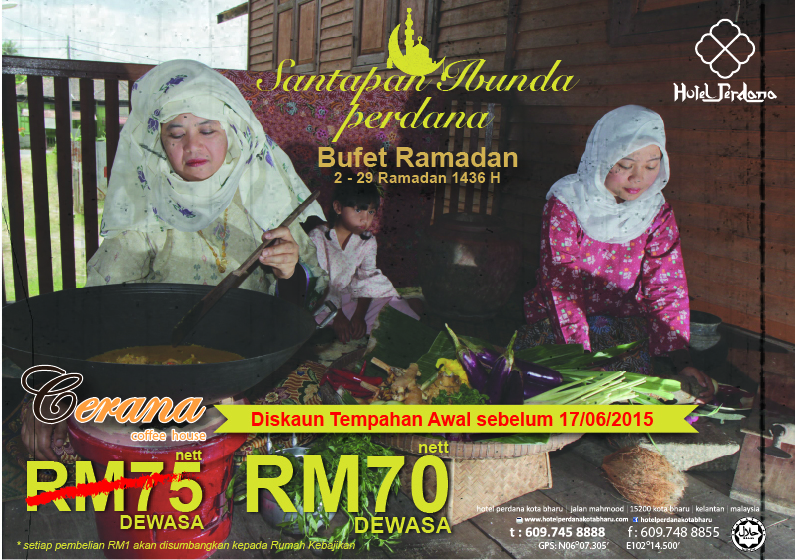 All these lavish spread is only for RM75 nett per person and 50% discount is given for children aged 5 – 12 years old.